In mid-April, like a cool spring rainfall, Master appeared at the Florida Center. At that time, Florida was suffering from the worst drought in a hundred years. There were even restrictions on water use and a ban on all fires. The fruit trees at the Center had all turned brown and died, and everyone was wondering when it would rain. Then Master came. As soon as She arrived, She invited all the resident disciples to Her house. Master was wearing a plastic suit that covered Her whole body and holding a large white dog in Her arms. She told us that the dog was sick, since She had found him at an animal shelter. We could hardly believe our eyes. Over the years, we had become accustomed to Master's high standards of cleanliness. Wherever She went, everything would become spotlessly clean. To find even one speck of dust in Her room would be an amazing sight. And there She was, holding a sick and slobbering dog right up to Her face. Over the next few weeks, Master adopted more unwanted pets, including birds. 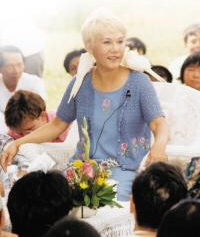 (She meant to free the birds into the wild as soon as they had healed their wings). Her immaculate house became like the movie "Ace Ventura: Pet Detective"-full of all kinds of creatures, making noise night and day, and even sleeping in Her bed! Master's pets are not just ordinary pets. She treats them like Her own children. She hugs them, plays with them, and talks to them in the most loving manner one can imagine. She always knows if they need to go outside, and when they come back they are cleaned at once with diluted lemon juice. She gives them special dog toothpaste, dog eye drops, "dog everything." And Master feeds them Her own food with Her own hands. Perhaps it is not correct to say "Her" food, because the dogs eat it first! Master eats their leftovers. Truly, it is like a fairy tale, where animals are just like people. When Master talks to them, they respond just like people do. 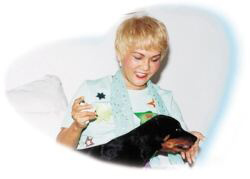 Master explained that since She took them from the animal shelter, they had gradually changed and become very spiritual beings. She also told us how She talks to them. If they are good, She speaks in a very high voice, and if they do something wrong, She speaks in a lower voice. Usually, though, She does not use Her voice at all--She just sends "pictures" of what they should do, and they understand right away. Master also took care of the neighbor's pets. When She first came, a neighbor's dog came to the Center. Master immediately sent him home, after having his eye discharges wiped clean. We had been feeding him and so he kept coming back, Master says that it was not right to take someone else's dog, even though the neighbor did not take good care of him. And She sent the dog home with a brand new dog bed, along with dog medicine, dog eye drops, a vegetarian dog-bone, and many other things for dogs that he needed! She later went back to the neighbor's house for a "follow-up visit." She takes care of animals just like Dr. Dolittle, (the movie character with a gift for communicating with animals.) Any creature that comes to Her house receives full treatment. She even took pity on the big, ugly vultures that came and made a mess of Her yard, giving them food every day. Master has also made friends with all the neighbors around the Center. One day, a neighbor had a fire in his backyard, and Master immediately called all the resident-disciples and led us right up to the frontline, telling us how to distribute water and dig firebreaks. With Master's guidance, we succeeded in containing a section of the fire. The fire then spread to other areas, though, and the minute it got too big, Master called everyone out. She gathered us together to make sure that we were all okay, and explained that She had only instructed us to go inside because there was no wind. The resident disciples went home to enjoy some cold drinks, but Master went back to the site of the fire to give water and gifts to the firemen. Then She checked up on all the neighbors in the area. That evening, a neighbor family had no electricity, so Master immediately offered them a place to stay in Her own trailer by Her house. She explained later that we could not do much to stop the fire, but the important thing was that we had fulfilled our duty to "love thy neighbor." That was just one occasion, but every day something different would happen. One day, Master took us to a roadside diner. When we entered, the waitress was not very polite and would not let Master bring any animals into the restaurant. Later, when she was walking by Master's table, she noticed that there was a bird on Master's napkin. Master smiled sweetly at her, but the waitress gave Her a very disapproving look. Then the waitress discovered that Master had brought a dog in Her shopping bag, so she gave Master more stern glances. Finally, Master said, "What's wrong? You look so bad, like you are having a bad day or something?" Then the waitress said in a very tired voice that she had been told to work a double shift, even though it was a holiday. Master then announced to the disciples in the restaurant, "Nobody should give this lady any trouble. She's having a bad day and has to work a double shift!" Next, She took the waitress' hand and kissed it. The waitress kept looking at the floor, but then she couldn't help breaking out in a big smile. So Master said, "Wow! You look so beautiful when you smile!" and started to say many loving things to the waitress, who turned bright red and ran behind the counter, covering her face with her hat. Master had won her over with love and kisses! Above all, however, Master was concerned about us, Her disciples. From the day She came to Florida, She tried to find a place for disciples to come see Her, and so we could have a comfortable place for retreats. Every day for many weeks, She drove all across Florida to look for land, sometimes returning late at night. Many times She was disappointed, because someone had given Her false advertising, or changed the price, and She had to sort through all kinds of conflicting information about permits, regulations, etc. She said that maybe God just wanted her to run around Florida because of the drought problem. Indeed, from the time Master came to the area, it had rained almost every day, so much so that the local newspapers were at a loss to explain it. All of our fruit trees, which had been dead to the root for many months, suddenly sprouted green leaves. During this time, there was a lot of pressure on Master. Many disciples were hoping to see Her, especially on Her birthday, and Master was sometimes brought to tears. On Her birthday, She was still working. We had prepared a barbecue that evening to celebrate, and Master came to join us. She told jokes, sang songs, and shared Her food with everyone.